A new paper by Hansen et al., Ice melt, sea level rise and superstorms: evidence from paleoclimate data, climate modeling, and modern observations that 2 °C global warming is highly dangerous is currently under review at the journal Atmospheric Chemistry and Physics Discussion. The paper explores the possibility of, and consequences of, much more rapid melting of earth’s great ice sheets in Greenland and Antarctica. It surveys evidence from the previous interglacial (the Eemian, about a hundred thousand years ago) of rapid fluctuations in sea level, its potential impact on the ocean’s overturning circulation, and of extreme storms as a consequence. It also reports the results of model simulations which include more, and rapidly increasing, injection of fresh water in regions of the ocean (around Antarctica and the north Atlantic) near the great ice sheets. One thing to note is that this is not just the work of James Hansen; rather the many authors include a host of top experts: J. Hansen, M. Sato, P. Hearty, R. Ruedy, M. Kelley, V. Masson-Delmotte, G. Russell, G. Tselioudis, J. Cao, E. Rignot, I. Velicogna, E. Kandiano, K. von Schuckmann, P. Kharecha, A. N. Legrande, M. Bauer, and K.-W. Lo. There is evidence of ice melt, sea level rise to +5–9m, and extreme storms in the prior interglacial period that was less than 1 C warmer than today. Human-made climate forcing is stronger and more rapid than paleo forcings, but much can be learned by combining insights from paleoclimate, climate modeling, and on-going observations. We argue that ice sheets in contact with the ocean are vulnerable to non-linear disintegration in response to ocean warming, and we posit that ice sheet mass loss can be approximated by a doubling time up to sea level rise of at least several meters. Doubling times of 10, 20 or 40 years yield sea level rise of several meters in 50, 100 or 200 years. Paleoclimate data reveal that subsurface ocean warming causes ice shelf melt and ice sheet discharge. Our climate model exposes amplifying feedbacks in the Southern Ocean that slow Antarctic bottom water formation and increase ocean temperature near ice shelf grounding lines, while cooling the surface ocean and increasing sea ice cover and water column stability. Ocean surface cooling, in the North Atlantic as well as the Southern Ocean, increases tropospheric horizontal temperature gradients, eddy kinetic energy and baroclinicity, which drive more powerful storms. We focus attention on the Southern Ocean’s role in affecting atmospheric CO2 amount, which in turn is a tight control knob on global climate. The millennial (500–2000 year) time scale of deep ocean ventilation affects the time scale for natural CO2 change, thus the time scale for paleo global climate, ice sheet and sea level changes. This millennial carbon cycle time scale should not be misinterpreted as the ice sheet time scale for response to a rapid human-made climate forcing. Recent ice sheet melt rates have a doubling time near the lower end of the 10–40 year range. We conclude that global warming above the preindustrial level, which would spur more ice shelf melt, is highly dangerous. Earth’s energy imbalance, which must be eliminated to stabilize climate, provides a crucial metric. Much of the work is speculative, but it is supported by both evidence and literature review. Of course some critics will find countervailing literature, and call the evidence into question. I’d say those are valid, even important, things to do. But this paper doesn’t really claim to be a definitive exposition of how climate change will unfold, rather it’s an exploration of possibilities, in particular the possibility and consequences of rapid ice sheet decay. It’s just one of the reasons that there is now near-consensus that the IPCC projections for 21st-century sea level rise are not just out of date, but too low. However, there’s quite a difference between nonlinear mass loss and truly exponential, and we simply don’t have enough data yet to know. But just as we can’t yet reliably claim exponential mass loss, we can’t rule it out either. Hence, although this idea is speculative, it’s also possible, and I believe it’s crucial for us to explore the consequences of what will happen if it turns out to be the case. One of the consequences, of course, will be extreme sea level rise — enough to make coastal regions simply unliveable. The result is dire, and the cost almost unimaginable. That alone makes any realistic possibility worthy of consideration. and by the recent but apparently persistent increase in sea ice area surrounding Antarctica. Countering the increase of surface air temperature comes at more than one price. Not only does it necessitate so much sea level rise as to drown cities and areas where billions of people live (including many of the greatest cities in the world, such as here in the U.S.), it also reduces poleward heat transport enough to amplify the equator-to-pole thermal gradient, and that contributes to a large increase in superstorms. The upshot is that, if ice melt proceeds as the new work suggests it actually might, the future is not pretty. It’s ugly. The comments which have been submitted so far are, in my opinion, a very strong argument NOT to have this kind of open discussion review. One of them is, simply put, crackpot denialism. The very first comment was submitted by journalist Andrew Revkin, but it looks to me like nothing in it that’s substantive is by Andrew Revkin. Instead, its his report of what he was told by geologists he contacted. What the hell is going on here? If those geologists want to raise objections or contribute comments, great, let them do so — but second-hand, hearsay “reporting” from a reporter who lacks the knowledge base to make his own comments, does not constitute valid review. NASA calls it a Tisdale Recovery. 3: Greenland and Antarctica are already losing ice mass with a doubling time closer to 5 or 6 years than 10 years. It would only take four more doublings of the rate of ice melt to contribute 40mm per year of sea level rise. We know this can happen because it has already happened in the past. What we don’t know so well from the palaeoclimate data is how quickly it can happen, but the modern observations suggest it could be in less than 30 years from now, if the doubling time continues as it has done for the last couple of decades. It’s certainly not poorly founded speculation to say that we are looking at a serious risk of disastrous consequences for the coastal regions of the world. I’ve always been somewhat wary of the Hansen & Sato multi-metre SLR prediction (perhaps ‘prediction’ is too strong a word) for a number of reasons. Firstly, it relies on an exponential increase that for me is yet far from apparent. 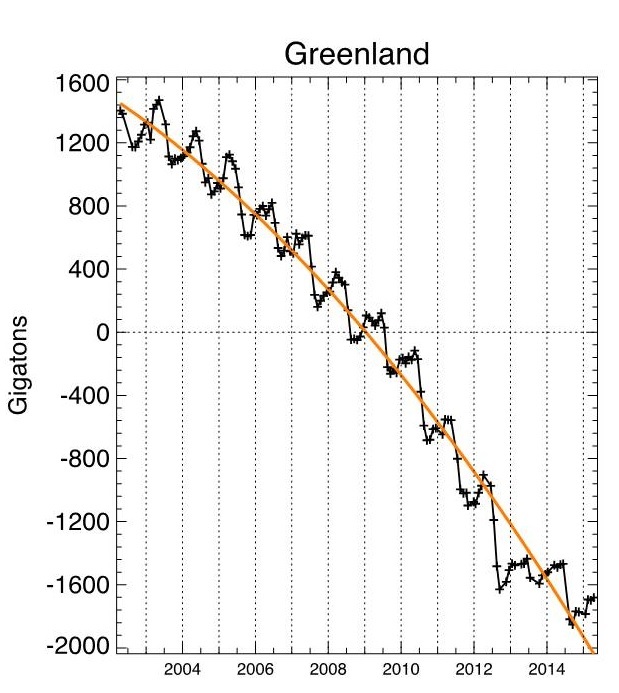 The GRACE data for Greenland as graphed above looks a likely candidate for exponential melt, especially up to 2013, but if instead of straight mass balance the rate of ice loss is plotted (see here usually 2 clicks to ‘download your attachment’), the acceleration appears linear rather than exponential. And secondly, there is the energy requirements. An exponentially rising melt rate requires far too much energy for the melt to happen in situ. A large discharge of ice into the oceans would be required and I think we need to be examining how that would happen before proclaiming too loudly a 5 metre SLR by 2100. Of course, if the SLR by 2100 is not as catastrophic as suggested by Hansen et al (2015), there is still the catastrophic SLR we are stoking up for future centuries which tends to be ignored by all the attention we give to 2100 SLR. Equilibrium SLR is presumably less controversial than the 2100 assessments. IPCC AR5 Figure 13.14 indicates Equilibrium SLR is somewhere about 2.3m/ºC with an extra 6m when Greenland melts out. The argument is then solely about how quickly that will happen. The GRACE data for Greenland as graphed above looks a likely candidate for exponential melt, especially up to 2013, but if instead of straight mass balance the rate of ice loss is plotted (see here usually 2 clicks to ‘download your attachment’), the acceleration appears linear rather than exponential. An exponential trend plus noise is at first indistinguishable from a linear trend, then a quadratic, a cubic and so on. Higher order terms take time to make their presence known, and so long as a quadratic plus noise is a good approximation so will a constant acceleration. Yes, a quadratic fits. It may very well be that there are detailed physical arguments for this as opposed to exponential. I have yet, however, to see what arguments they make (statistical, paleoclimate or physical) for exponential in the paper itself. Actually, there is a very very rough physical argument for a quadratic time dependency of the melt flow: during melt, the melt rate is more or less proportional to the heat flow. This is more or less linear in the temperature difference ice surface – environment. The latter is rising more or less linearly with time. 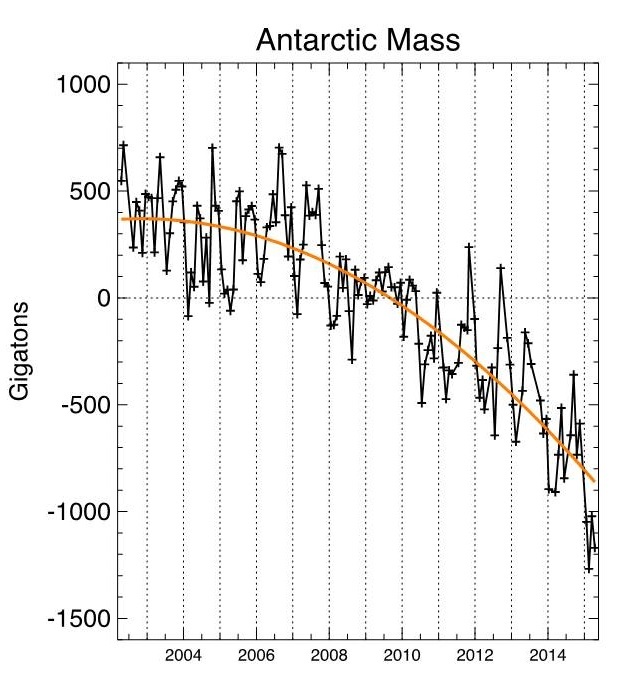 To add antarctic melt and thermal expansion (the latter only linear! ), and we end up in the vicinity of 60 years (2075) for the meter, and 180 years (2200) for the 7 m. Estimated error +- 30%. The darkening of the ice surface due to forest fires certainly doesn’t help here much. Kinmod, if your analysis is correct, where melt rate is proportional to temperature and melt rate increases as the square of time due to linearly increasing temperature, this will imply that holding temperature constant results in the melt rate being a constant function of time. There is a problem with this, however: it doesn’t take into account the existence of feedbacks. A classic feedback is the albedo “flip”. Dry snow has an albedo of roughly 0.9. Bare ice has an albedo between 0.5 – 0.7. Shallow melt ponds have an albedo of 0.2 – 0.4, deeper ponds will have an albedo of 0.15. With lower albedos more sunlight will be absorbed. This increases the amount of thermal energy that is entering the snow, ice and ponds. Open ocean has an albedo of roughly 0.04. If you raise the temperature of snow high enough it will become wet and consequently, darker. Maintaining a constant temperature the rate of melt will actually accelerate as more melt results in a darker surface, and consequently, the absorption of more solar energy. And as the authors point out, there isn’t just one feedback but many. The critical issue is whether human-spurred ice sheet mass loss can be approximated as an exponential process during the next few decades. Such nonlinear behavior depends upon amplifying feedbacks, which, indeed, our climate simulations reveal in the Southern Ocean. The more melting occurs, whether at the due to surface melt or melt from below, the more vulnerable ice shelves will be to mechanical stresses where ocean waves will begin to crack. What cracks develop will expose greater surface area and volume of the ice to sea water and heat exchange. Further wave action will break up the shelves into icebergs. If melt is from above as in the Greenland ice sheet, meltwater will quickly reach the bottom where it results in basal lubrication. Fortunately, with Greenland much of the valleys are prograde, meaning that they rise the further you get away from the ocean. Unfortunately the same is not true of the West Antarctic Ice Sheet. There the valleys are retrograde, dropping the further into the ice sheet a valley goes. Deep warm ocean water that makes it underneath a glacier there will tend to put mechanical stress on the glacier, raising it, and penetrate more deeply into the ice sheet. Another major feedback dealt with in some detail is that melt water introduces greater ocean stratification. The surface water will tend to cool. As in the case of Antarctica, sea ice may even expand. But in the process deeper, warmer ocean currents will be insulated against the colder temperatures of the surface. Thus they will result in more basal melt of ice shelves, and penetrating a retrograde valley, ultimately the ice sheet itself. Frieler et al. (2015) assert that 35 global climate models are consistent in showing that a warming climate will yield increasing Antarctic snow accumulation, but this paleo “affirmation” refers to slowly changing climate in quasi-equilibrium with ocean boundary conditions. s. In our experiments with growing freshwater injection the increasing sea ice cover and cooling of the Southern Ocean surface and atmosphere cause the increased precipitation to occur over the Southern Ocean, rather than over Antarctica. This feedback not only reduces any increase of snowfall over Antarctica, it also provides a large freshening term to the surface of the Southern Ocean, thus magnifying the direct freshening effect from increasing ice sheet melt. Far from equilibrium conditions result in more feedbacks being in play, and in this context, exponential behavior seems more reasonable than any low order polynomial behavior. Timothy Chase: Thanks for the excerpt of the publication. I admit that my “melting process model” is as primitive as it can be. It even does not allow for radiation heat exchange. IMO it still has a value: it gives kind of an upper bound and an order of magnitude for the processes involved, it gives a feeling of what kind of timescales we are in. I guess, the total process has linear, quadratic and exponential subprocesses, mixed in a varying ratio,and there may even occur steplike events. For the time being, the real hefty positive feedbacks seem to not have set in yet. IMO it still has a value: it gives kind of an upper bound and an order of magnitude for the processes involved, it gives a feeling of what kind of timescales we are in. Order of magnitude, at least. But if it is order of magnitude, something which you estimate at 300 years based on a simple melt volume as a quadratic function of time may be 30 years given an exponential function. Generally speaking, exponential rates (not polynomial) are characteristic of natural systems with feedbacks. It is also characteristic that exponential processes do not continue for long periods. Ice melt rate MUST go to zero when all the ice has melted, for example. The important outstanding questions in my mind concern how long and where exponential melting processes will occur (giving detectable melt pulse increments in the sea level, for example). As I understand it this would be a rule of thumb. It makes sense if we are considering rabbits or bacteria. If each individual or couple can reproduce over a specific increment of time the population will double. Furthermore, this is a single feedback and it results in both size and rate of growth functions that are exponential. At the same time it is certainly step-like. This is something we can understand analytically, simply by means of algebra. No empirical studies need be involved. However, if the rabbits or bacteria begin to run out of food or space (either in terms of volume being finite or population density being too high) the population will begin to level off or perhaps even crash. At this point we will likely want to perform an empirical study. But for me I find it difficult to make the leap from the biological realm to the realm of inanimate matter, to ice. Ice cubes don’t multiply, do they? Well, perhaps they do. If an ice cube increases the albedo in its immediate vicinity sufficiently that at a given temperature over a given period of time a single ice cube will form, then in a certain sense, one could say that it has “multiplied”. And the same might be true of “melted ice cubes”, the dark patches of ocean that are left behind when an ice cube melts. But how does this work with melting ice in the real world? Undoubtedly an exponential function is only an approximation, but I get the sense that it is a fairly good approximation in many different areas of study, and the cryosphere is likely no exception. Perhaps it has something to do with self-organized criticality which results in a scale invariance similar to what we implicitly assumed regarding rabbit populations. Perhaps it has something to do being sufficiently far from quasi-equilibrium conditions — as is assured by how rapidly we have been warming our world. I suspect it does. If under quasi-equilibrium conditions melting is roughly balanced by freezing at the surface or the underseas edges of an ice shelf, then by moving the system sufficiently far away from quasi-equilibrium conditions you will introduce a feedback factor which will apply over a range of the system’s evolution as it moves from a state that is no longer in balance with its environment until it begins to approach a new state which is. … a standard linear regression fit to the log of 3-year moving average smoothed annual mass loss (2-year average of the first and last data points) had an R-squared of 0.8159 (N=22). The curve would give a mass loss in 2015 of 190.55 GT and in 2024 of 397.50 GT, suggesting a doubling time of slightly less than nine years. Or one might create a model based on actual physical conditions and physical equations then analyze the results under different runs with slightly different initial conditions. I am not aware of anyone who has done that as of yet. When simulated losses exceed 1 mm/year of sle, much greater losses generally follow within a few years. Joughin, Ian, Benjamin E. Smith, and Brooke Medley. “Marine ice sheet collapse potentially under way for the Thwaites Glacier Basin, West Antarctica.” Science 344.6185 (2014): 735-738. Once a critical threshold or tipping point, is crossed rapid change ensues. The paper is paywalled, but I deal with it in greater detail here and you can probably find a copy of the paper with either Google or Google Scholar. Actually we do not know what all Hansen, et. al. are suggesting with respect to Figure 8 in particular. We do know what Sato & Hansen have published in the past (with Hansen’s online update even), that 5-year and 10-year doubling times are what they think the ice sheet SMB data suggests to date (or some such, have to find and link to those two sources, if necessary). One could of course “reverse engineer” Figure 8b (which I did) and use both analytical and numerical integrations to check Figure 8b (which I did). So if Hansen, et. el. are claiming that “a century” is sometime in the 22th century, then Hansen, et. al. are quite obviously correct, however, if “a century” is EXACTLY equal to 100 years, then again, quite obviously Hansen, et. al. are incorrect. As to the purported 5-year doubling, we do have 22+ years of CU GMSL data, which, if I’m not mistaken, would include four 5-year doublings if past SMB contributions were indeed exponential. So, essentially a 1mm/yr growth in the rate of SLR (integrated this is about 7mm in 25 years or 7.2 mm total integrating to minus infinity). D’oh! We only have to wait 5 years to see the next 7.2 mm of GMSL, then ~3 years to see the next 7.2 mm of GMSL, then ~2 years to see the next 7.2 mm of GMSL, then ~1.6 years to see the next 7.2 mm, then ~1.3 years to see the next 7.2 mm, then 1.1 years to see the next 7.2 mm GMSL, then ~1 year to see the next 7.2 mm of GMSL, in other words, for 5-year doubling time we only have to wait 15 years (at most) to see more than a 2X increase in GMSL rates from the current rate for just the ice sheet SMB portion alone). Good luck with that one. So, until I see a sea level closure budget (which Hansen, et. el. do NOT provide and which AFAIK no one has shown to date) circa 1990-2015, showing an exponential growth in the ice sheet SMB contribution to GMSL, then and only then, will I buy off on the 5-year doubling curve assumption (because it clearly can’t be seen in the 22+ years of GMSL data given that 7mm total takes only ~2.5 years at the current total GMSL rate, so in essence the S/N ratio (or uncertainty) in our current estimates greatly exceeds our rather glacial, pun intended, (approximately) linear rate of change seen in the GMSL estimates to date). At this time, I’d SWAG a 15-year doubling rate for the 1st meter only. I believe we can quite easily if we look at the charts (not just 8a or 8b) and read what the text has to say regarding the different scenarios. Why are you focusing on what two of the authors may or may not have said in the past when this paper is written by 17 authors who now have available more recent data and the current paper suggests that something somewhat higher than 10 years is closer to the doubling time? Recent ice sheet melt rates have a doubling time near the lower end of the 10–40 year range. No reason to assume that the authors believe the doubling time is 5 years. Closer to 10 years, perhaps, but more likely something somewhat above this. Judging from the text itself. … on your way to advanced calculus? Thus we examine our simulations in more detail (Fig. 17). The pure freshwater experiments add 5mm sea level in the ﬁrst decade (requiring an initial 0.346mm yr^−1 for 10 year doubling), 10mm in the second decade, and so on (Fig. 17a). Cumulative freshwater injection reaches 0.5m in year 68 and 2.5m in year 90. Performing the calculations this way (albeit using an Excel spreadsheet, since I am calculating things at the yearly level with freshwater injections and cummulative amounts) using a doubling time of 10 years and an initial year fresh water injection of 346mm, I find that for year 68 the cummulative sum is 0.532m, year 90 the sum is 2.463m, and for year 100 I have 4.932m. Each of these figures are (with rounding to the nearest tenth of a meter) the same as what they are getting, what they plotted in 8b for a doubling time of 10 years. Are you claiming that they “purport” fresh water injection has a 5 year doubling time? Ice mass losses from Greenland, West Antarctica and Totten/Aurora basin in East Antarctica are growing nonlinearly with doubling times of order 10 years. Continued exponential growth at that rate seems unlikely for Greenland, and reduced mass loss in the past two years (Fig. S20) is consistent with a slower growth of the mass loss rate for Greenland. However, if GHGs continue to grow, the amplifying feedbacks in the Southern Ocean, including expanded sea ice and SMOC slowdown likely will continue to grow and facilitate increasing Antarctic mass loss. Once again, they seem to be suggesting that the actual doubling time is in the neighborhood of 10 years, not 5. Why do you prefer to focus on the lower bound that they choose to include in their analysis as if it were what they “purported” was actually the case? Looking at the charts that they have their baseline is the year 2000, and as my calculations assuming a baseline of 2000 arrive at the same figures as they arrive at with their calculations, I believe we can safely assume 2000 is their baseline. … and once again, you seem to assume that they are claiming the doubling time is 5 years, not 10+ years that is actually suggested by the text. The Velicogna et al. (2014) analysis of gravity data for 2003–2013 ﬁnds the Totten sector of East Antarctica losing 17±4Gt yr^−1, with the loss accelerating by 4±1Gt yr^−2, and the Victoria/Wilkes sector including Cook glacier losing 16±5Gt yr^−1, with a small deceleration (2±1Gt yr^−2). And if you know the mass, given water density and the ocean surface area, you can calculate the contribution to sea level. And once again you insist that they are assuming a 5 year doubling time when the text makes clear that something a little in excess of 10 years is what they take to be the number supported by the data. Regardless, unless you take magic tricks at face value, it should be clear that when ice shelves, glaciers and ice sheets lose mass, that mass goes somewhere, and setting aside thermal expansion of the ocean, given the mass lost to the ocean you can calculate the number of millimeters that will be added to sea level. Anyway, I chose to respond to you because its obvious lack of understanding isn’t your problem and you aren’t worth David’s time. You repeatedly, knowingly misrepresent what you are arguing against then ridicule it in order to troll. Seriously get a clue, long story short? I was paid to do some work for the USACE almost exactly 3 years ago to this date. That’s where I “played” around with the exponential curve fitting that Hansen & Sate suggested (the two lead authors mind you with a known track record of claiming 5M GMSL by 2100AD, and then (Hansen) doubling down on that SWAG a couple of years later). BTW, their 5M SLR by 2100AD “paper” did not get published in a high profile journal. I wonder why? Perhaps, 5M by 2011AD is a ludicrous number at this point in time. An exponential fit is just curve fitting, plain and simple as that. 10-13 years of SMB data that’s it. Move the exponential fit up/down the y-axis, really simple stuff. What’s the objective criteria for goodness of fit? There certainly is no physical basis (physics/theory) that Hansen can, or does, claim on this one, that’s for sure. IMHO, it is a good thought experiment though, but there you have Hansen himself “rushing” the paper in time for the Paris talks, sort of fits a certain Denier meme (everything that both groups (Deniers and climate scientists) do, is a runup to COP21, just like the IPCC reports). And, of course we have Hansen’s beliefs (as previously published) with respect to 5M SLR by 2100AD, and that’s a fact. Homey don’t play dat (fisking). If you scale Hansen et al (2015) Figure 8b with a little more precision, you will find that, for the blue 20-year doubling trace,1m SLR above 2000m is reached on 22nd September AD2109. As a pedant myself, I would not call anything less than 2m SLR to be multi-metre but, in the sense that multi-metre is a value greater than 1m, Figure 8b does in fact indicate “a 20 year doubling rate produces multi-meter sea level rise in a century” from today. The (preliminary) numbers I get are 2137.5AD (analytical/numerical (numerical done as a simple FD check)) for 2m SLR (there should be an ~12-13mm offset for the constant 1mm/yr for 2003-2015 (I started in 2015.0AD so 12mm in my case)) and 2129.3AD from Figure 2b. Why the 8.3 year difference? Now it get’s sort of technical, but long story short? The entire 20-year doubling curve (including 2003-2015) can be plotted as a semilog plot PLUS an offset (this is needed to straighten out the curve due to the initial linear portion), the offset I get is ~26.5mm (not 12-13mm), the analytical gives an offset of ~28.9mm at minus infinity (so I’m close to the correct offset), R^2= 0.999996 for 2030-2156, for 2003-2015 R^2=0.9991 (however, it does get rather hard to estimate the values close to the zero axis). So, I’m fairly certain that my numbers are quite close to the 20-year doubling curve shown in Figure 8b. The other two doubling times are trivial to infer. I don’t think the Colorado SL site has incorporated the Watson numbers yet. In interviews on the 2015 paper, Hansen indicated there could be as much as 10 feet/3 meters in 50 years (2065?). Mauri Pelto has posted a comment in the interactive discussions. His comments at RealClimate have always seemed to be very good. JCH, I have no expertise in this area, but I suspect Mauri Pelto is “spot on” in both his praise and criticism. Also,for those who are interested, Hansen has responded at some length to Revkin. Paleoclimate data reveal that subsurface ocean warming causes ice shelf melt and ice sheet discharge. So far, I’m not getting the idea that in situ melting is a big part of the ‘Hansen et al’ picture. The projections for SLR are graphed out for 5, 10 & 20 year doubling periods in the paper (fig. 8). The 20 year doubling hits 5m SLR with a rate of rise that I calculate requires 60,000 cu km of ice to melt/discharge per year. (The ‘ice melt/discharge requirement’ is obviously greater for quicker SLR projections.) I’m of the view that either the energy requirements for in-situ melt need consideration or the potential source of that quantity of ice discharge should be identified in some manner. This may be a trivial task but I feel it is a necessary step to give the hypothesis of these various doublings some basis. E J Rohling has an interesting paper on what an acceleration in SLR would look like. An aspect I find worrisome is that we’re already seeing signs of freshwater injection at both poles. Freshwater injection… I assume this means that ice is melting, producing freshwater which is entering the ocean. But by the thermal map, I assume that what you are actually referring to the consequences of this injection: ocean circulation is showing a significant response to this injection, with a reduction in the strength of some major currents, reducing poleward heat transport, which may temporarily overwhelm warming in places like Western Europe. It does not have to melt, it simply has to calve off into the ocean and then melt as it moves away from the pole. This means that the floating ice will cool the water at intermediate distances from the ice cap edges. Back-radiation does not exist and cannot exist and those photons that you are talking about do not head to surface in the first place. If a colder object radiates back to a warmer object, the warmer object will radiate more energy to the colder object and here we go, temperature spirals out of control. This of course is not observed. This very subject was discussed and settled by our forefathers in the 18th, 19th, and 20th century. Heat transfers from a warmer object to a colder object, period. To claim otherwise, you have to revise every book in world first. Apparently winter home thermal insulation is just snake oil since it is colder than the inside of your house and cannot possibly warm it since this would involve the transfer of heat from insulation which is colder than the interior of your house to the interior of your house. Of course the second law to which the author is appealing simply forbids the net transfer of heat from something which is cold to something which is hot and in no way forbids something colder from reducing the rate of heat loss by a warmer object. Eli dealt with this here in relation to Gerlich and Tscheuschner, and it was later expanded into a fuller critique (pdf) by Joshua Halperin, Chris Ho-Stuart, Chris Colose, Joel Shore, Arthur Smith and Joerg Zimmerman. Re Swedan this seems apt: No it’s not your opinion. You’re just wrong. An idiot, of course. Too bad he adds to the noise level in the review process–albeit probably not by much, given that his evaluating his expertise won’t take any time at all. In this vein, I think that open peer review is a benefit, in that it educates the public on the nature of the scientific process and areas of reasonable disagreement. At the same time, in areas where public discussion tends to have a low signal to noise ratio, it would be advisable to limit the reviewers to people with some actual expertise in the area or areas of discussion, preferably, those who have contributed to peer reviewed literature. Koonin, Eugene V., Tatiana G. Senkevich, and Valerian V. Dolja. The ancient Virus World and evolution of cells. Biol Direct 1.1 (2006): 29. The paper is a real gem, dealing with the origin and nature of life and nature of evolution, but the discussion between authors and reviewers adds to this, examining questions related to the nature of science and human knowledge itself. That discussion is limited to experts in evolutionary microbiology. As such they were able to raise intelligent points that reflected the actual state of science. If, however, there hadn’t been some attempt to limit participation to individuals with relevant expertise, it is quite possible there would have been creationists who argued that, like the greenhouse effect , evolution violates the second law of thermodynamics. In a larger community discussing the paper and its reviews, this may easily have robbed productive discussion of oxygen. Furthermore, it would likely contribute to the public perception that issues raised by cranks are debatable since they are being debated, in an online technical journal, nonetheless. There is also a response to David Archer from Rud Isvtan, a clown who is also a regular guest author at Judith Curry’s blog, who libels O’Leary et al, authors of a paper on sea level rise off the WA coast, accusing them of “academic misconduct”. Richard Telford had commented on Isvtan’s claims re O’Leary et al previously. As well as dishing out abuse, he appears to be taking the opportunity to promote his self-published e-book (with foreword by Judith Curry) which is little more than recitation of the usual climate denier memes presumably written to make a few dollars from the gullible. One advantage of open review I suppose is people who would not normally go to Curry’s blog can get a feel for the sewer that she hosts & encourages first hand. Yes, isn’t that just precious? Our wee little darling just ran his very first thought experiment! So cute! It was wrong, of course, but really, what can one expect? Does it matter if a journalist or scientist points to relevant published literature? If the papers are relevant, they should be considered. I think when journalists start to get involved in the scientific process, it does potentially cross a line. There are certainly journalists (David Rose being one example) who have a habit of being extremely selective in what and who they quote and give the impression that they see themselves as somehow in a position to judge the merits of a piece of scientific work. As far as I see it, investigative journalism involves talking to relevant experts and writing something that is – at least – an attempt to be an objective report of whatever is being investigated. When a journalist starts to see themselves as capable of independently assessing some complex piece of scientific work, then it – IMO – potentially speaks to their objectivity. We report the largest elicitation on future sea-level rise conducted from 90 experts from 18 countries. [Response: I read your “review.” Any comment which right off the bat says “I contacted geologists” doesn’t belong. It betrays that you are so ignorant of the subject matter and of the primary literature, that to get enough information to muster a comment you had to ask somebody else. But for some reason you feel that because you “contacted geologists” you’re qualified, not only to lecture us on what should and shouldn’t be included, but to comment on research which is outside your area of expertise … whatever that is. Maybe you’re genuinely impressed by your title; I’m more impressed with the peer-reviewed scientific publications of Hansen, Sato, Hearty, Ruedy, Kelley, Masson-Delmotte, Russell, Tselioudis, Cao, Rignot, Velicogna, Kandiano, von Schuckmann, Kharecha, Legrande, Bauer, and K.-W. Lo. I’m not quite sure what your point is. Simply that there are other scientific papers that present conflicting results? Sure, that’s not surprising given how controversial this new paper appears to be. I was simply responding to your question as to whether or not it mattered if journalists get involved in directly discussing the scientific credibility of a particular piece of research. I’m again not sure how that is really a response to what I was suggesting. I don’t know if you have the expertise to present a review of this paper, but – given how much effort goes into to developing sufficient expertise – I would be surprised. My point was more general, though. It seems to me that – in general – journalists report on results by – ideally – talking to relevant experts and building up as objective (as possible) a sense of the position. I think that when journalists cross the line into thinking that they themselves can assess the merits of a complex piece of work they run the risk of losing objectivity. Andy, the paper you cite surveying expert opinion is from January of 2014. There are more recent studies which might significantly alter those results where the same survey taken today. They strongly suggest that it may be too conservative in its “projections”. Open Access: Rignot, E., et al. “Widespread, rapid grounding line retreat of Pine Island, Thwaites, Smith and Kohler glaciers, West Antarctica from 1992 to 2011.” Geophysical Research Letters. When simulated losses exceed 1 mm/year of sle, much greater losses generally follow within a few years. Using our basin-scale model, however, such rapid collapse is difficult to model, especially because interaction with other basins becomes increasingly important. Thus, we take 1 mm/year of sle to be a threshold that, once crossed, marks the onset of rapid (decades) collapse as the grounding line reaches the deepest regions of the marine basin. In our 250-year simulations, only the highest-melt, weak-margin simulation reaches this critical threshold. Paywalled: Joughin, Ian, Benjamin E. Smith, and Brooke Medley. “Marine ice sheet collapse potentially under way for the Thwaites Glacier Basin, West Antarctica.” Science 344.6185 (2014): 735-738. Now they do say that in 250-year simulations, only the high melt simulation reaches the threshold. However, it appears that current behavior is tracking more closely to that simulation than others. The observed losses from 1996 to 2013 (Fig. 3A) fall between the results from our highestmelt (m = 3 and 4) simulations. Over this period, the average simulated melt of 84 Gt/year for m = 4 agrees well with recent melt estimates of 69 to 97 Gt/year (7, 8), indicating that the higher-melt simulations’ early stages reasonably approximate present conditions. Our simulations are not coupled to a global climate model to provide forcing nor do they include an ice-shelf cavity-circulation model to derive melt rates. Few if any such fully coupled models presently exist (13). As such, our simulations do not constitute a projection of future sea level in response to projected climate forcing. The results, however, indicate the type of behavior that is likely to occur. In particular, all the simulations show the grounding line stepping back in stages with concurrent increases in discharge, consistent with other models and observations of paleo–ice-stream retreat (31, 32). The global sea level potential of 3.5 m flowing through Totten Glacier alone is of similar magnitude to the entire probable contribution of the WAIS (ref. 29). As with the WAIS, much of the broader drainage basin accessible to a retreating Totten Glacier is grounded below sea level, with a potential contribution of 5.1 m (Supplementary Information), so instabilities from ice–ocean interaction in East Antarctica could have significant global consequences. Paywalled: Greenbaum, J. S., et al. “Ocean access to a cavity beneath Totten Glacier in East Antarctica.” Nature Geoscience (2015). It’s not entirely your fault Andy. About 3 years ago the NYT had a fully staffed good quality environment / climate department. Now they’ve just got you. Andy when you find the row too hard to hoe, pick up the phone and ring somebody. Take your cue from Sou over on Hotwhopper. She is neither a physicist nor a statistician but she has all manner of physicist’s and stat’s phone numbers and never finds herself in the situations you appear to be mired in. 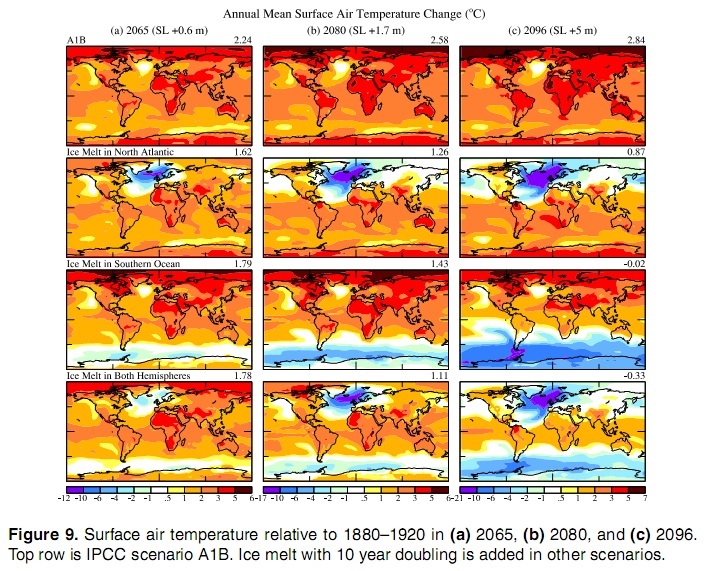 I’m surprised that in the A1B + ice melt scenarios that the tropics themselves also cool – I would have expected that with less ocean heat transport, that the north Atlantic would cool more, but the tropics warm more, but it seems like in these simulations ice melt actually cools the whole planet compared to the A1B scenario (and indeed, the average global temperature change relative to 1900 is negative in the +5 m Southern and both hemisphere simulations). Is it the heat of fusion, or the injection of a layer of cold water on top of the oceans, or what is the mechanism for this? Thank you very much for this. I should have asked your permission first, but I’ve used my “verified” status to post some large quotes on DotEarth comments. I might have hesitated on grounds of politeness, but I’ve had a bellyful of nonsense from that quarter and think the material itself is important. I hadn’t get gotten to your mention of the Revkin comment on Hansen’s item when I started, and am glad I hadn’t, because I think your substance is an outstanding review of the material itself, and I didn’t paste that bit. Always grateful for your work when I can follow it. Just for the record, when I made this comment only the first two comments above were available. I don’t regret what I did, but it is a bit more personal than it should be (fault of both “sides” I guess, should I shut up about something I believe is important just because I know I’m unwelcome?). OTOH, the attack on Hansen did smack of animus more than substance, and I tend to be in the firing line myself while the phony skeptics proceed largely uncorrected. in it (m be mass flow, t time, c a constant). And even then one can only say, that observations are consistent with the proposed model. I find this “oh its rising faster than linear, it must be exponential” meme every now and then in the web, and it’s always kind of unsatisfying. That’s not nitpicking, by my reading you’re agreeing with the OP. The sentence you are quoting, in full, says “A big source of uncertainty is the use of truly-exponential ice sheet decay.” It’s my reading that the OP meant exactly what you mean, namely that choosing a specifically exponential model to fit based on only enough observations to conclude that the decay is faster than linear leads to significant uncertainty in projections because (a) the model may be incorrect, (b) it will take a lot more data to know, and (c) it can make a big difference in a fairly short amount of time. I feel that OP corrected the sentence to the one you cite. I found the commentary by the geologists helpful. The giant “boulders” formed in place by differential erosion, a process seen many places in the American Southwest although the shapes a rather different there. So there is no good evidence of superstorms. What we have seen in recent years is tropical cyclones which simply become larger and larger, to the point of covering the western North Pacific. But not that much stronger. I am under the impression there are physical limitations on maximum wind speeds, but for certain with high winds the waves are simply blown apart, knocked down into spray or, under gusty conditions, chopped into smaller waves. I’ve observed this last phenomenon myself, from 6 miles up. “Superintense storms”–ie., beyond what Emmanuel et al modeled–have been shown to exist in simulations, though. I’ve had the impression that there is sedimentary evidence for extremely intense storm activity in hothouse earth episodes, but haven’t found anything this morning to unambiguously corroborate that. One of the numerous papers cited in the review could hold the key to that, but I’m running out of time to devote to the question. Anyway, thanks for provoking an illuminating search! Another critical component of the model presented here is the strong dependence of tropical cyclone activity on climate. Unfortunately, very few proxies of past storminess are available to test this important assumption. Liu and Fearn  examined sediment cores from nearshore lakes around the Gulf of Mexico and were able to detect sand layers resulting from storm over-wash deposits. While this technique appears to be a reliable indicator of hurricanes near the lake sites, currently available data does not extend as far back as the last ice age. Brandt and Elias  show that there is some correlation between the thickness and extent of tempestite deposits and proxies of atmospheric CO2, suggesting that the intensity and/or frequency of severe oceanic storms was greater during warm periods such as the late Cretaceous. I found the commentary by the geologists helpful. Given the role that geology plays in the paper having a geologist as a reviewer might be of some value. David writes:The giant “boulders” formed in place by differential erosion, a process seen many places in the American Southwest although the shapes a rather different there. So there is no good evidence of superstorms. In terms of paleoclimate evidence, the paper relies on more than just the boulders as paleoclimate evidence of the superstorms. In particular, it also refers to the chevrons. Bourgeois, Joanne, and Robert Weiss. ““Chevrons” are not mega-tsunami deposits—A sedimentologic assessment.” Geology 37.5 (2009): 403-406. … which, when examining the chevrons of Madagascar, essentially interprets them as giant sand dunes, a product of wind, not waves. These authors interpreted many of these “chevron” bed forms as mega-tsunami deposits of Holocene age (past ~10 k.y.) and suggested that they point to oceanic asteroid impacts (e.g., Masse, 2007). By examining such images, we originally became skeptical of the tsunami interpretation because many of the “chevrons” are oriented at low angles to the coastline, and the orientations persist over distances and topographies that should steer flowing water, but not wind. In the Bahama Islands, extensive oolitic sand ridges with a distinctive landwardpointing V-shape are common, each standing in relief across several kilometers of low area (Hearty et al., 1998). Termed “chevron ridges” from their characteristic V-shape, these beach ridges are found on broad, low lying platforms or ramps throughout the 25 Atlantic-facing, deep-water margins of the Bahamas. Hearty et al. (1998) examined 35 areas with chevron ridges across the Bahamas, which all point in a southwest direction (S65◦ W) with no apparent relation to the variable configuration of the coastline. … which Hansen et al. likewise believe argue against a super-tsunamis as the cause for the chevrons. A tsunami conceivably deposited the boulders, but the area is not near a tectonic plate boundary. The coincidence of a tsunami at the 20 end-Eemian moment is improbable given the absence of evidence of tsunamis at other times in the Bahamas and the lack of evidence of tsunamis on the Atlantic Coastal Plain of the United States. The proximity of run-up deposits and nested chevron ridges across a broad front of Bahamian islands is clear evidence of a sustained series of high-energy wave events. The lightly indurated ooid sand ridges are several kilometers long and appear to have originated from the action of long-period waves from a northeasterly Atlantic source. The chevron ridges contain bands of beach fenestrae, formed by air bubbles trapped in fine ooid sand inundated by water and quickly indurated. The internal sedimentary 5 structures including the beach fenestrae and scour structures (Tormey, 2015) show that the chevrons were rapidly emplaced by water rather than wind (Hearty et al., 1998). As such, in the paleo-tsunami/paleo-cyclone debate that has raged since the 1980s, Hansen et al. argue against tsunamis as well (as the more recent wind-deposition) and fall on the side of the paleo-cyclones. The giant “boulders” formed in place by differential erosion, a process seen many places in the American Southwest although the shapes a rather different there. So there is no good evidence of superstorms. In terms of paleoclimate evidence, the paper relies on more than just the boulders as paleoclimate evidence of the superstorms. In particular, it also refers to the chevrons. In terms of windspeed, like Doc Snow, I was reminded of Kerry Emmanuel’s hypercanes. However, I do not believe that this is what Hansen et al require. Waves are produced by winds, but wind speed is only one factor in the production of large waves. There is also the fetch – the extent of the water over which the wind is blowing. Presumably the larger storms which you acknowledge are produced by global warming would have a larger fetch. I am dubious about an ever increasing rate of ice sheet destruction for WAIS via Pine Island Glacier and its neighbors. The rate will certainly grow over the next many decades but then there are limitations. This won’t be even close to the average rate during Meltwater Pulse 1a by reasons of geography and the current state of WAIS. But even 6 mm/yr will be very bad especially as it is sustainable for about 5000 years at current CO2 levels, based on the sea stand during the Miocene. I think it is a bit unfair to judge the open review process by how it works for this paper. If it had not been publicized early, then it would probably not have attracted non-expert comments. Finally, the editor presumably can assign zero weight to crackpot comments. I’m not saying the process is perfect, but I can say from personal experience that at least sometimes the open process does add value: In my first paper in an egu journal I really got some useful constructive feedback from the open reviews. It was “an estimate of global glacier volume” in The Cryosphere. I have experienced a situation where I as a reviewer identified what I judged to be fatal flaws in a paper, yet the paper was accepted with no substantial revisions. In that case it would have been nice if the reviews had been out in the open. 1) other people could read my argument. 2) I could see the other reviews, and perhaps better understand the editorial decision. I think this is more related to decadal variability in the north Atlantic subpolar gyre. For example, NASA press release from 2004, discusses a weakening of the gyre associated with warming in the centre of the gyre. My understanding is that one of the hopes for skillful decadal climate forecasts is that the models will be able to predict the decadal variability in the subpolar gyre, but I don’t know how successful they have been. If the models are capable of that then they would be able to unpick how much of the recent change was forced due to global warming and how much was due to natural variability. That said, the Rapid array in the Atlantic that is monitoring the Atlantic Meridional Overturning Circulation is picking up a consistent decline in the strength of the AMOC that is starting to turn a few heads. Thank you for posting on this paper. My understanding of why Hansen et al. submitted to ACPD was to elicit discussion, which is why I was hoping to get some more insight into the possible exponential trends in the ice mass loss and SLR data. Is there a method (Bayesian perhaps?) that would be able to tell if an exponential fit to the data is justified? Is there a way to tell which doubling time best fits the data – presumably if these are exponential processes, then the resultant timescales will become extremely important. As far as having limited data for curve fitting, their SLR data (Fig. 29) should also be expressable as a linear+exponential trend. Anyway, this is all intended in the spirit of analysis and not intended to be a knock on the research. I ask these questions here, because I do not want to bog down the review process over at ACPD (which unfortunately appears to have begun). I think it is important to remember that the authors of Hansen et al. 2015 (I have only read the paper once and have not yet read the supplementary information) frequently emphasize deficiencies in their work. The two most important, in my opinion, are the large grid cells and the ocean mixing rate. In a very real sense, this is a call-out for others to improve the modeling and/or provide funding to be able use more-expensive, higher-resolution models. The idea that ice melt from Antarctica (and/or Greenland) could increase exponentially is obviously a simplifying assumption, primarily to examine the general consequences of increasingly large, cold, freshwater inputs to the oceans. We know that the ice melt (or gain) rates do and will differ in different sections of Greenland and Antarctica. The Sutterley et al. 2014 paper (cited in Hansen et al. 2015 on page 20116) was interesting to me because it provided almost twice as much data as is shown in the post for Greenland and Antarctica based on the GRACE data. On 17 December 2014, I did a quick look at the Amundsen Sea Embayment data in Sutterley et al. 2014 and found that a standard linear regression fit to the log of 3-year moving average smoothed annual mass loss (2-year average of the first and last data points) had an R-squared of 0.8159 (N=22). The curve would give a mass loss in 2015 of 190.55 GT and in 2024 of 397.50 GT, suggesting a doubling time of slightly less than nine years. I’m looking for the underlying SMB time series data for Greenland and Antarctica, similar to, or exactly the same as shown in your two plots above. Are the above time series available somewhere’s on the web, similar to say the CU GMSL time series? It looks like the above data includes recent, circa 2015 data. I’ve been searching the web, but am unable to find the latest data products, except for the GRACE gridded data products (which is a bit above my current pay grade). Andy Revkin has now linked to this article, seems he still thinks he knows better. In addition to adding Judith Curry to his respondents, he has harshly criticized you for hiding behind your anonymity, neglecting to mention that it was Watts that outed you as Paul Foster, and making sure everybody knows your name, and claimed common ground with you as a musician. I’ve long been a participant, but I think he’s gone round the bend on this one. Of course, you could say that any advertisement is good advertisement and it sure does get the clicks. (I’m not including the lengthy clarification, which in my opinion clearly supports your position. Specialty: Glaciology, sea level rise; geophysics, continuum mechanics, fluid mechanics, numerical modeling, photogrammetry. Dr. Steven A. Leibo, the Sherman David Spector Professor in the Humanities at the Sage Colleges in New York, specializes in Modern International History & Politics. He teaches courses on a range of topics from Modern China, the Modern Middle East, and Modern World History to classes on Globalization and Climate Change. Dr. Leibo has also taught at the State University of New York at Albany since 1986. A former Fulbright scholar, Prof. Leibo specializes in the relationship between Asia and the West. Leibo has extensive experience leading study tours through Vietnam. Leibo is also a documentary filmmaker. His most recent film is From Albany to Saigon: Vietnam & the Capital Region. I had intended to look up all his sources but got busy with other things; these two will give the reader a taste of how choice of apparent authorities can slant material for the layperson. The whole thing sounds peevish and degrades the arena of scientific discussion. This, along with his enabling of Wattsupia in his comment section does not speak well of his judgment and scientific integrity. He should spend more time worrying about properly representing all views and less on what appears to be pure ego and certainty. My blockquote makes my note about Ferreira (“I’m not including the lengthy clarification, which in my opinion clearly supports your position.”) look like a quote from her instead of my words.and reverses its meaning. If you feel like fixing it, that would be welcome. ThIs sorry recrudescence of “Science by Press Conference ‘ recapitulates the program of media hype we witnessed in 1983 , when , even before peer review began “nuclear winter” coauthors ,Paul Ehrlich and Carl Sagan gave a K Street PR firm $100,000 for pre-publication publicity for their scary scenario. The old high water mark of pre-peer review climate hype featured a barrage of apocalyptic artists conceptions and talk of “the extinction of homo sapiens ” culminating in a special issue of the nation’s largest circulation weekly, Parade Magazine, where the review process amounted to nothing more that the Editor talking to the author, possibly while shaving– Sagan was both. Many applauded that effort to scare the world into disarmament, but as I told Steve Schneider at the time I viewed so raw an exercise in propaganda as a threat to the credibility of climate modeling on the eve of global warming debate. What Councli for a liveable World president George Rathjens called ” the worst example of the misrepresentation of science to the public in my memory” ought to have warned the world about the hazards of subordinating science to advertiing. Instead, its perverse polemic success seems to have made it a Best Practice for publicists on both sides of K Street, Having known Sin at Hiroshima, science was bound to run into advertising sooner or later later. Rathjens warned against predicating disarmament on mythology; I believe that principle applies to climate policy as well. appear to intend. And from a policy perspective, consideration of worst cases is long overdue. Russell, I believe the authors of the paper would greatly appreciate your contributing something substantive to review of their paper. I would too, actually. 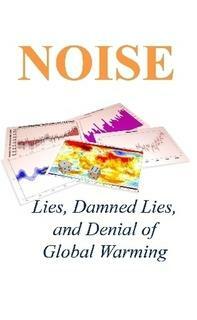 Indeed, we should ignore claims that global warming stopped in 1998, and other silly myths. I doubt if ice sheet melt will be exponential, but I don’t know what it will be. I would be happy if we just removed government subsidies for insurance. Except, of course, that nuclear winter is no mythology, despite constant right-wing efforts to make it so. Loft enough soot into the stratosphere and nuclear winter is indeed what you’ll get. But Seitz has such a burning political hatred for Carl Sagan, he’ll go on maundering about “the nuclear winter hoax” for the rest of his life, despite the fact that Sagan is in his grave for 21 years now. It seems to be the local assumption that if only questioning critics could be silenced then particular policies would quickly be adopted to solve the advancing climate problem. Barton just told a lie- that is not a quote from me. Barton, nuvclear winter, as advertised in all its apocalyptic glory was not just a myth, but a literally one dimensional one. I’m trying to see this as science by press release but it doesn’t fit. It looks more like a discussion paper with a lively discussion. I expect revision and then publication, but with comments helpfully in the public domain. Granted not all comments there are sensible. David Archer’s is quite interesting though. At first blush Archer seems to be brown nosing, but once I read a bunch of the references, and references to the references, I now find his comment to be chocked full of insight. I bet his students are having the a lot of fun. I see what he means by recent developments. For example, one of the difficulties people seem to be having with the paper is how surface cooling might be associated with more rapid melt and how this may be a positive feedback mechanism. However, the basic mechanism is fairly straightforward. Fresher, increased meltwater leads to ocean stratification with reduced Southern Ocean overturning. The colder surface is insulated from the warmer ocean currents below. This makes possible the expansion of surface ice. Warmer deep ocean currents will no longer be cooled by heat exchange with the atmosphere. This leads to more basal melt – which is where we are currently seeing the melt leading to the destruction of the ice shelves taking place. This leads to more icebergs and more surface freshening. Rinse and repeat. Our IBRD [ice berg rafted debris] record shows clear evidence for episodic mass loss of the AIS [Antarctic Ice Sheet] during the last deglaciation, but further work is required to identify the sources of mass loss associated with each AID [Antarctic Ice Sheet discharge] (Methods). Millennialscale AIDs, similar to those observed in the Northern Hemisphere, are indicative of abrupt ice-sheet instabilities that initiated within one to a few decades, released fresh water into the Southern Ocean, and contributed to the overall deglacial sea-level rise. The peak of AID6 is synchronous, within the dating uncertainties, with MWP-1A [Melt Water Pulse 1A]. Modelling results indicate that ocean thermal forcing from the transport of warm Circumpolar Deep Water to the base of ice shelves may have been an important positive feedback in AIS deglacial dynamics. Weber, M. E., et al. “Millennial-scale variability in Antarctic ice-sheet discharge during the last deglaciation.” Nature 510.7503 (2014): 134-138. Decades, not centuries. Furthermore, we are seeing evidence that this positive feedback mechanism is currently in operation. We have seen recent records of expanding sea ice in the Southern Ocean. We are also seeing accelerating ice shelf destruction due to subsurface basal melt, destruction which is now deemed irreversible in the Amundsen Sea, the so-called “weak underbelly” of the West Antarctic Ice Sheet. And increased snow seems to be falling predominantly over the cooler ocean surface, where it may further freshen surface water, leading to greater stratification, rather than over Antarctica itself. Another amplifying, positive feedback. Exactly. Good to see you posting again, Timothy. I remember you well from RC before the great slowdown articles. In the summer of 1982, I interned as a computer programmer at Energy Impact Associates in Forest Hills, PA. One of the company’s software products simulated plumes of radioactive material due to nuclear power plant malfunctions. They had a persistent problem with the plume heights being too short by a factor of three. I did a unit analysis. At one point in the code, they had feet on one side of an equation, and meters on the other. With that fixed, the plume heights suddenly made sense. Thompson and Schneider (1986) also had plume heights too short by a factor of three. I doubt they made the same mistake EIA did, because someone would have noticed by now, but they had something wrong. Many, many factors affect the severity of a nuclear winter. But the most important one is plume height. Does the soot of a burned city make it to the stratosphere, or not? Here’s why it matters. Let’s review the effect of aerosols on climate. In brief, and oversimplifying terribly, dark aerosols low down warm the surface by absorbing sunlight. This happens often on Mars, where a climate model won’t give accurate answers without a good dust scheme. Bright aerosols high up cool the surface, by blocking sunlight. This is the case with Earth’s clouds. But in the stratosphere, even absorption can cool the surface, because sunlight absorbed there doesn’t make it to the ground. That’s one effect of Earth’s ozone layer. And reradiating IR doesn’t help. Remember that Earth’s atmosphere is optically thick in the IR. That not only keeps surface radiation from making it out easily, it keeps stratosphere radiation from reaching the ground. But the exact figure doesn’t much matter. The point is that this stuff absorbs like crazy. These absorption coefficients are similar to those for ozone in the ultraviolet. You get a bunch of soot in the stratosphere, and not only will most of it stay there for 1-3 years, but the ground will come close to freezing for a long, long time. Crops will fail. And the “nuclear autumn” paper had the plume heights too short by a factor of three. Other things besides plume height matter, of course, like location and season. For the worst case, northern hemisphere in summer, we get full-blown apocalypse. For the best case, southern hemisphere in summer, no effect at all. So a globally dispersed nuclear war, like the one that almost happened nine times between 1962 and 1995, would give us somewhere between 0% and 100% of climate apocalypse. Want to take a chance that a major nuclear war is survivable? Or even a small nuclear war? Want to play Russian roulette? Want to use an automatic? Sorry, that should have read “southern hemisphere in winter” above. Stories that made you laugh? I’m down here now (seems fitting that I should be at the bottom). Everett, the first year injection he gives in 0.346mm. (See pg. 20087 of the paper, as indicated above.) Given his baseline year of 2000 and an end year of 2100 AD, “doubling-down” at 5m cumulative sea level rise (SLR) is doubling-down on a 10 year doubling time which I pointed out is what they claim is “near” what current data supports. Considering a 5 year doubling time is no more indicative of their actual position than when they consider a 20 year or 40 year doubling time. 5 year and 40 year doubling times are considered not because they are likely but because, like two standard deviations, they may very well bracket what is likely.